Students don't take "tests" in this class... they take "exams"! And they don't just take "exams"... they take "Blue Book Exams". ﻿﻿Dr. Hartnell prides himself in the fact that he was the first high school Honors teacher in this state to use Blue Books. It has been proven that his Honors' students become some of the best writers at Westerville North... but it's not without a lot of work. Now, before you go racing to your ﻿﻿counselor to drop this Honors class, Dr. Hartnell implores you to read on. Running will not make the big, bad Blue Book Exams "go away". It'll only anger them, and they WILL find you... in college. While Dr. Hartnell knows Blue Books are not customary in high school, he feels students transitioning from middle school should be exposed to this sort of writing and critical thinking. Students have become accustomed to memorizing dates and facts and regurgitating them on a standard "plug-and-chug" test. After surviving Blue Book Exams in college, and after reading University of Florida's Dr. Robert A. Hatch's article "Like, What's a Blue Book, Dude? ", Dr. Hartnell decided to introduce Blue Books to Westerville. According to Dr. Hatch, "Blue Book Exams are a normal part of academic life. Academic life, of course, is not normal. But, it does present a socially acceptable way to focus on personal skills. Properly pursued, the whole process aims to bring about change we associate with learning. As one of many academic avenues, Blue Books offer a way to approach yourself and to confront what you know and how well you communicate your thoughts and beliefs. What is sometimes most scary is that we don't like what we find. What we want for ourselves and what we have are different. Learning focuses on this difference, and Blue Book Exams provide a practical and periodic way to organize what you have learned and what is missing. It is designed to challenge. If you've taken an in-class essay before, you have a fair idea of how difficult it is to write persuasive prose under pressure. Time will fly, and you will not be able to write as much as you know. If you have not taken a Blue Book Exam before, get ready. Blue Books ask that you present your understanding and interpretations of course material in lucid, persuasive prose. This 'Blue Book Challenge' is not designed for fun. But the process can be gratifying." Dr. Hatch hit it on the head. Like his examinations, Dr. Hartnell's Blue Book Exams are not designed for enjoyment. Rather, they are designed to be rigorous and as a way to truly push your limits as an Honors student. Being able to write... and write well... is such an important skill to possess. While it'll help you pass all future essay exams in high school and beyond, it'll also allow you to be a functioning (and productive) member of society. And that is a skill far more rewarding than any "A" in a history class. Dr. Hartnell will MAKE you a better writer... and learner. For more tips on how to prepare for a Blue Book, please read the Blue Book Survival Guide, which can be found by clicking here. 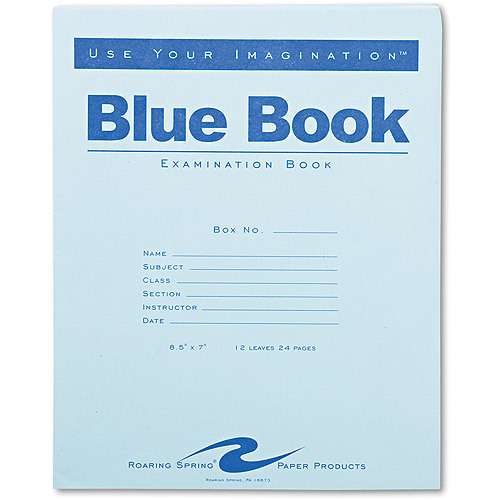 A Blue Book is a small, stapled packet of wide-rule notebook paper with a blue cover. Blue Books were first used at Yale University, which is why the covers are sky blue in color. For this class, you MUST select Blue Books that measure 8.5” x 7” and contain 8 sheets (16 pages if you count front-and-back). Larger sizes, or ones with more sheets, will NOT be permitted during examinations. Blue Books are available at any college book store and at our school store. You will need at least 12 Blue Books for the entire year. Six of these will be given to Dr. Hartnell (without your name on them), who will keep them until exam day. The other six can be used for practice.